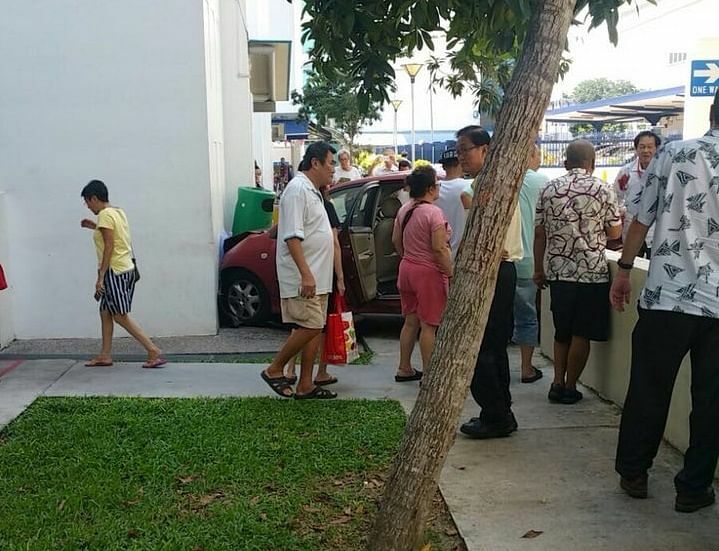 SINGAPORE - A man was injured after crashing his vehicle into the exterior of a lift shaft of a Housing Board block in Marine Parade on Saturday (Nov 4). The Straits Times understands that while the driver sustained minor injuries, he did not wish to be sent to the hospital. Singapore Civil Defence Force said it responded to a call at 1.25pm at Block 59 Marine Terrace. After arriving at the scene, SCDF officers assessed the situation and no one was taken to hospital, the spokesman said. According to a resident, a red Toyota crashed through a gap in a concrete barrier at the open-air carpark. The driver, who the resident said looked like he was in his 60s or 70s, had blood stains on his shirt and an abrasion on his right arm. "He looked like he was in a daze, probably in a state of shock," said the resident, who declined to be named.